Neuropathic pain can develop after nerve injury, when deleterious changes occur in injured neurons and along nociceptive and descending modulatory pathways in the central nervous system. The myriad neurotransmitters and other substances involved in the development and maintenance of neuropathic pain also play a part in other neurobiological disorders. This might partly explain the high comorbidity rates for chronic pain, sleep disorders, and psychological conditions such as depression, and why drugs that are effective for one condition may benefit others. Neuropathic pain can be distinguished from non-neuropathic pain by two factors. Firstly, in neuropathic pain there is no transduction (conversion of a nociceptive stimulus into an electrical impulse). Secondly, the prognosis is worse: injury to major nerves is more likely than injury to non-nervous tissue to result in chronic pain. In addition, neuropathic pain tends to be more refractory than non-neuropathic pain to conventional analgesics, such as non-steroidal anti-inflammatory drugs and opioids. However, because of the considerable overlap between neuropathic and nociceptive pain in terms of mechanisms and treatment modalities, it might be more constructive to view these entities as different points on the same continuum. This review focuses on the mechanisms of neuropathic pain, with special emphasis on clinical implications. In the past decade, several reviews have been written on the mechanisms of neuropathic pain, most of which are directed at neuroscientists. Yet it is essential that clinicians understand the mechanisms too, because such an understanding can steer future research and guide clinical practice. In September 2013, we searched the databases on Medline via PubMed and Ovid, Embase, and CINAHL Plus using the keywords “neuropathic pain”, “sensitization”, “neuroplasticity”, “mechanisms”, “reorganization”, “sympathetically maintained”, “antinociceptive”, and “descending modulation”, with no date restrictions. For individual sections, keywords relating to specific topics and mechanisms were identified from the initial search (for example, “ion channel expression”, “cytokine”, “glial cell”) and searched using the same databases. Additional articles and prime references were obtained by cross referencing all search terms with “review article” and searching through reference lists. We considered animal studies, experimental and clinical trials, and review articles published in English. Perception: a key component of the clinical pain experience that integrates cognitive and affective (emotional) responses. In evolutionary terms the activation of high threshold mechanical nociceptors or other types of specialized nociceptor served a protective role, acting as a warning system for dangerous stimuli. But whereas inflammatory pain is adaptive, evolution has failed to account for our enhanced ability to survive trauma, disease, or iatrogenic trauma intended to prolong or enhance quality of life (such as surgery). In these contexts pain no longer serves a useful function but becomes the disease itself. Although it is easy to conceptualize pain as a homogeneous entity, this is overly simplistic. In reality there are several different types, each with distinct neurobiological and pathophysiological mechanisms. The most common categorization divides pain into two main types: neuropathic and nociceptive pain (table 1⇓). This distinction is important because it not only reflects the cause of pain but also informs treatment. Nociceptive pain can be classified as somatic (for example, muscles, joints) or less often visceral (internal organs). Because of the high concentration of nociceptors in somatic tissues, chronic somatic pain is typically well localized and often results from degenerative processes (such as arthritis). By contrast, internal organs are usually unresponsive to classic painful stimuli, such as cutting and burning, but respond to ischemia (for example, angina), inflammation (appendicitis), or occlusion of flow that results in capsular distension (bowel obstruction). Neuropathic pain is defined as pain resulting from injury to, or dysfunction of, the somatosensory system.9 In neuropathic pain, tissue damage directly affects the nervous system, resulting in the generation of ectopic discharges that bypass transduction.10 One subtype of neuropathic pain is central pain (for example, as a result of spinal cord injury), which manifests as a constellation of signs and symptoms that follows an insult to the CNS as a necessary, but not always sufficient, inciting event. Although many forms of nociceptive pain, and some forms of neuropathic pain, may confer evolutionary benefits, chronic neuropathic pain is always maladaptive. A common misconception is that pain is purely a physiological phenomenon. In fact, “pain” represents a final integrative package, the components of which consist of neurophysiological processes as well as contextual, psychological, and sociocultural factors. This is one reason for the discrepancies between preclinical studies (which measure increased tolerance to painful stimuli in animals (anti-nociception)), clinical studies (which assess efficacy), and clinical practice, which measures effectiveness (table 2⇓). Partly because of these factors and the neurophysiological differences between individuals, the degree of pathology tends to correlate poorly with the intensity of pain for conditions such as back pain.13 To illustrate, conditions such as fibromyalgia have high reported pain scores despite the absence of overt disease. Because pain is multidimensional experience, it is not surprising that psychosocial factors such as depression, somatization, poor coping skills, social stressors, and negative job satisfaction can predict the development of chronic pain after an acute episode.19 20 In addition, the context in which a painful stimulus occurs affects how we perceive it. This is why an injury that occurs during a football game may be less painful than a similar injury that occurs while walking to school, and why acute pain, which we anticipate will get better, is better tolerated than chronic pain. Once injury occurs, inflammation and reparatory processes ensue, leading to a hyperexcitable state known as peripheral sensitization. In most patients, this state resolves as healing occurs and inflammation subsides. However, when nociception persists because of repeated stimulation from ongoing injury or disease (for example, in diabetes), the changes in primary afferent neurons may persist. Several factors can contribute to peripheral sensitization. Inflammatory mediators such as calcitonin gene related peptide and substance P, which are released from nociceptive terminals, increase vascular permeability, leading to localized edema and the escape of the byproducts of injury, such as prostaglandins, bradykinin, growth factors, and cytokines. These substances can sensitize as well as excite nociceptors, resulting in lowered firing thresholds and ectopic discharges. The fact that multiple substances can sensitize nociceptors may partly explain why no drug is universally effective and there is a ceiling effect for antagonists that work at only one receptor (such as non-steroidal anti-inflammatory drugs (NSAIDs)). Ectopic discharges can give rise to spontaneous pain and may originate from the dorsal root ganglion, other points along an injured nerve, or even uninjured adjacent fibers.21 The process by which adjacent uninjured nerve fibers become excited as a result of non-synaptic “cross talk” is known as ephaptic transmission. Allodynia refers to pain produced by a normally non-painful stimulus, and it may result from decreased stimulation thresholds. Allodynia can be classified as mechanical (pain in response to light touch) or thermal, and it can readily be detected on physical examination. An example is a patient with diabetic neuropathy whose feet are sensitive to putting on socks. Hyperalgesia refers to exaggerated pain perception as a result of damaged peripheral pain fibers, and it can be categorized as primary or secondary. Primary hyperalgesia occurs in injured tissue as a result of sensitization of peripheral nociceptors (for example, tenderness after a cut), whereas secondary hyperalgesia is seen in adjacent undamaged tissue owing to sensitization within the CNS and can be assessed with a sharp object. In part, this may be caused by ephaptic transmission or the expansion of receptive fields of injured nerves (or both). A clinical example of hyperalgesia might be an amputee who is unable to use a prosthesis because of tenderness overlying the stump. Both allodynia and hyperalgesia are forms of evoked, or stimulus dependent, pain. Although spontaneous neuropathic pain is often more common and distressing than evoked pain in clinical practice, preclinical studies usually measure evoked pain (fig 1⇓).22 It is still not clear whether animals that develop evoked pain incited by models of peripheral nerve injury experience spontaneous pain. One contributor to spontaneous firing of nerve fibers after injury is the increased expression of sodium channels in dorsal root ganglia and around the terminal injury site (neuroma) of injured axons.23 Since this discovery, further preclinical studies have shown that a variety of sodium channels are involved in pain. After nerve injury, the expression of some of these channels increases de novo, the expression of others diminishes, and some translocate into different cellular compartments.24 The proliferation of heterotopic sodium channels, such as Nav1.3, Nav1.7, and Nav1.8, may lower the stimulation threshold and provoke ectopic discharge, resulting in spontaneous pain. In addition, the spread of sodium channels may trigger central sensitization, leading to allodynia. Several adjuvant drugs, such as carbamazepine, act through the blockade of sodium channels. Yet, because none of these drugs is selective for channel subtypes involved in pain, all have low therapeutic indices and many side effects. Differentiated neurons have different properties from undifferentiated ones, which enable them to perform specific functions (Aδ and C fibers transmit pain). After nerve injury, hundreds of genes that affect nerve function are upregulated or downregulated, and this can affect excitability, as well as transduction and transmission properties. Because gene expression affects cellular characteristics, this can result in a change in the phenotype of the nerve fiber, such that neuromodulators usually expressed in C fibers (such as calcitonin gene related peptide, substance P) are now expressed in other fibers.28 This may theoretically result in stimuli that are usually innocuous being perceived as painful. After injury to a sensory nerve, atrophic changes (wallerian degeneration) cause a decrease in the size of the cell body and the axon diameter, and eventually neuronal death. This leads to a decreased density of intraepidermal nociceptors. Depending on the type of nerve injury, this may cause loss of sensation or, paradoxically, hyperalgesia and increased pain (deafferentation pain).29 Severing the link between a nerve and its end organ also deprives the nerve of nerve growth factor and other neurotrophins, which are essential for growth and maintenance and serve as signaling molecules. One example of deafferentation pain is phantom limb pain after amputation. Although electrodiagnostic studies may be normal in people with a loss of small pain transmitting nerve fibers, a decreased density of C fibers can be seen on skin biopsy. In response to local release of nerve growth factor, collateral sprouting may follow neuronal loss. Intracellular regulators such as protein kinases (for example, protein kinase C) and transcriptional factors (such as nuclear factor-κB). The term “windup” refers to the progressive increase in the frequency and magnitude of firing of dorsal horn neurons produced by repetitive activation of C fibers, a phenomenon that requires glutamatergic NMDA receptor activity. Spinal glutamatergic activity can in turn initiate intracellular signaling cascades, including activation of protein kinase C, that result in long-lasting neuroplastic changes in the spinal cord.42 Similar to the role of central glutamatergic mechanisms in the pathogenesis of other neurological disorders such as epilepsy and Alzheimer’s disease, glutamate receptors are integral to the development of central sensitization, and blockade of both NMDA and non-NMDA receptors has been shown to attenuate neuropathic pain in animal models.43 Because of its primary role in neuroplasticity and excitotoxicity, the NMDA receptor has been implicated in such diverse areas as memory, opioid tolerance, and opioid induced hyperalgesia—the phenomenon whereby opioid use paradoxically increases pain sensitivity.44 In clinical practice, the use of NMDA receptor antagonists to prevent opioid tolerance and hyperalgesia has been disappointing.45 The long-term use of these drugs to treat chronic neuropathic pain has also had mixed results, and their use may be limited by side effects, particularly psychomimetic ones, which seem to increase in proportion to potency. The use of ketamine infusions as a treatment for refractory neuropathic pain has generated intense interest, although studies are limited by methodological flaws and lack of long term follow-up (table 3).46 The rationale behind these infusions is that high doses may “reset” the nervous system back to its pre-injury state, in essence reversing central sensitization. Descending inhibition plays an important role in determining how people experience pain. Recently, it has been shown that descending modulation can be both inhibitory and facilitatory, with conflicting signals often arising from the same regions.81 The balance between inhibition and amplification is dynamic and influenced by context, behavior, emotions, expectations, timing, and pathology. After injury, there is an initial spike mediated by changes in the activation and gene expression of NMDA and AMPA excitatory glutaminergic receptors, and a subsequent decrease in the excitability of neurons in the rostral ventromedial medulla, which lead to facilitation and inhibition, respectively.82 The evolutionary advantage of these changes is that the initial stimulus is reinforced to ensure that it is given priority, but once this occurs the brain seeks to mitigate the consequences. Neuropathic versus nociceptive pain: different entities or part of the same continuum? Even the requirement for “nerve injury” in neuropathic pain is contentious. After a nociceptive stimulus, we feel pain because microscopic nerve fibers are embedded in the injured tissue. The difference between neuropathic and non-neuropathic pain might therefore be considered one of scope (large v small nerve injury), although many forms of neuropathic pain, such as small fiber neuropathy, also do not involve discrete nerve injury. It is important to note that ascending spinal pathways, supraspinal regions that process these signals, and descending modulation pathways are essentially the same for neuropathic and non-neuropathic pain. This creates a difference between the taxonomic classification of pain and the functional and practical classification. Considering the large overlap between neuropathic and nociceptive pain, similar to the classification of other neurological disorders (such as tension-type and migraine headaches) that share pathophysiological mechanisms and overlap in their response to treatment,99 the different types of chronic pain might best be viewed as points on the same continuum. It is anticipated that translational pain research will play an important role in understanding pain mechanisms, formulating treatment and research paradigms, and developing new analgesics in the next decade. To facilitate this, several emerging developments must unfold. Firstly, new animal models should account for the influence of clinical comorbidities such as depression on nociceptive behaviors.100 This will be challenging, because animal models for emotional outcomes tend to be less studied than those for physiological parameters. Secondly, behavioral assessment tools should be capable of measuring the various dimensions of pain experiences, such as the use of conditional place preference or aversion (forms of pavlovian conditioning used to measure the motivational effects of positive and negative experiences) and behavioral coding in preclinical studies.101 102 For example, because the relief of pain is a reward in itself, analgesic agents that are not rewarding in the absence of pain should become rewarding only in the presence of pain. These research advances, together with the development of newer drugs tailored to individual patients and specific pain mechanisms, will probably improve the treatment of neuropathic pain in the coming years. Injury to the peripheral or central nervous system results in maladaptive changes in neurons along the nociceptive pathway that can cause neuropathic pain. Unlike acute pain, chronic neuropathic pain confers no individual or evolutionary advantage and is often considered to be a disease in itself. The myriad mechanisms involved in neuropathic pain overlap considerably with non-neuropathic pain and other neurological conditions. Although treatment based on the mechanism(s) of pain is widely accepted to be theoretically better than treatment based on the cause of pain, or empirical treatment, this paradigm can be difficult to implement in clinical practice. The multitude of different mechanisms, and the affective-motivational component of chronic pain that distinguishes “human pain” from nociception tested in preclinical pain models, make neuropathic pain notoriously refractory to treatment. This in turn has resulted in chronic pain being considered not only a medical problem but also a socioeconomic concern that requires urgent attention. Is it possible to devise a valid animal model that accounts for the “affective-motivational” (emotional) aspect of pain as well as the “sensory-discriminative” (physio-anatomical) aspect? Are there any measures that can be taken before (pre-emptive analgesia) or during the early phase after nerve injury that can prevent the transition to chronic neuropathic pain? Is neuropathic pain represented differently in the brain than other chronic pain conditions? 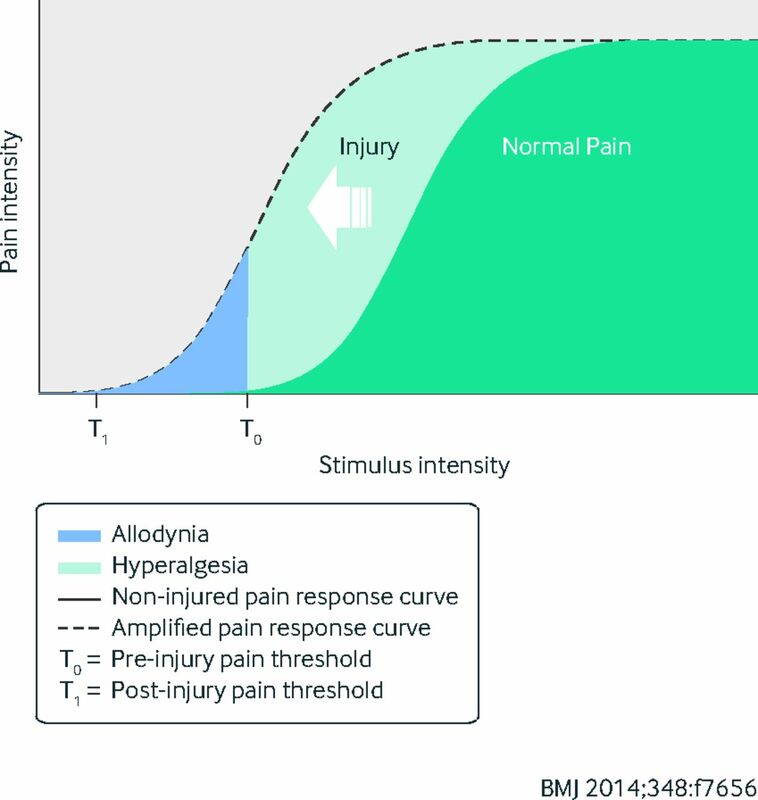 Can we develop better animal models to reflect spontaneous pain, rather than those that emphasize stimulus dependent pain (for example, allodynia), which may be less relevant in clinical practice? Although the concept of mechanism based pain treatment is intellectually enticing, can this be routinely incorporated into clinical practice? Thanks to Srinivasa Raja and Tony Yaksh for their help. Contributors: SPC conceived, designed, partly wrote, and reviewed the article and tables, and helped with the figures. JM wrote part of the article and tables and critically reviewed the article. Funding: Funded in part by the Centers for Rehabilitation Sciences Research, Uniformed Services University of the Health Sciences, Bethesda, MD, USA. The opinions or assertions contained herein are the private views of the authors and must not be construed as official or as reflecting the views of the US Department of the Army or the Department of Defense. Institute of Medicine Report from the Committee on Advancing Pain Research, Care, and Education. Relieving pain in America. A blueprint for transforming prevention, care, education and research. National Academies Press, 2011. http://books.nap.edu/openbook.php?record_id=13172&page=1. Leadley RM, Armstrong N, Lee YC, Allen A, Kleijnen J. Chronic diseases in the European Union: the prevalence and health cost implications of chronic pain. J Pain Palliat Care Pharmacother2012;26:310-25. Torrance N, Smith BH, Bennett MI, Lee AJ. The epidemiology of chronic pain of predominantly neuropathic origin. Results from a general population survey. J Pain2006;7:281-9. Bouhassira D, Lantéri-Minet M, Attal N, Laurent B, Touboul C. Prevalence of chronic pain with neuropathic characteristics in the general population. Pain2008;136:380-7. Henningsen P, Zipfel S, Herzog W. Management of functional somatic syndromes. Lancet2007;369:946-55. Woolf CJ, Max MB. Mechanism-based pain diagnosis: issues for analgesic drug development. Anesthesiology2001;95:241-9. Walsh DA, McWilliams DF. Pain in rheumatoid arthritis. Curr Pain Headache Rep2012;16:509-17. Cohen SP, Kapoor SG, Rathmell JP. Intravenous infusion tests have limited utility for selecting long-term drug therapy in patients with chronic pain: a systematic review. Anesthesiology2009;111:416-31. Treede RD, Jensen TS, Campbell JN, Cruccu G, Dostrovsky JO, Griffin JW, et al. Neuropathic pain: Redefinition and a grading system for clinical and research purposes. Neurology2008;70:1630-5. Devor M. Neuropathic pain and injured nerve: peripheral mechanisms, Br Med Bull1991;47:619-30. Freynhagen R, Baron R, Gockel U, Tolle TR. painDETECT: a new screening questionnaire to identify neuropathic components in patients with back pain. Curr Med Res Opin2006;22:1911-20. Smith BH, Torrance N, Bennett MI, Lee AJ. Health and quality of life associated with chronic pain of predominantly neuropathic origin in the community. Clin J Pain2007;23:143-9. Jarvik JG, Deyo RA. Diagnostic evaluation of low back pain with emphasis on imaging. Ann Intern Med2002;137:586-97. Giesecke T, Gracely RH, Grant MA, Nachemson A, Petzke F, Williams DA, et al. Evidence of augmented central pain processing in idiopathic chronic low back pain. Arthritis Rheum2004;50:613-23. Bornhovd K, Quante M, Glauche V, Bromm B, Weiller C, Buchel C. Painful stimuli evoked different stimulus-reponse functions in the amygdala, prefrontal, insula and somatosensory cortex: a single-trial fMRI study. Brain2002;125:1326-36. Chen JI, Ha B, Bushnell MC, Pike B, Duncan GH. Differentiating noxious- and innocuous-related activation of human somatosensory cortices using temporal analysis of fMRI. J Neurophysiol2002;88:464-74. Zubieta JK, Stohler CS. Neurobiological mechanisms of placebo response. Ann NY Acad Sci2009;1156:198-210. Jaggi AS, Singh N. Role of different brain areas in peripheral nerve injury-induced neuropathic pain. Brain Res2011;1381:187-201. Pincus T, Burton A, Vogel S, Field AP. A systematic review of psychosocial factors as predictors of chronicity/disability in prospective cohorts of low back pain. Spine2002;27:E109-120. Shipton EA. The transition from acute to chronic post surgical pain. Anaesth Intensive Care2011;39:824-36. Wall PD, Devor M. Sensory afferent impulses originate from dorsal root ganglia as well as from the periphery in normal and nerve injured rats. Pain1983;17:321-39. Rasmussen PV, Sindrup SH, Jensen TS, Bach FW. Symptoms and signs in patients with suspected neuropathic pain. Pain2004;110:461-9. Devor M, Keller CH, Deerinck TJ, Levinson SR, Ellisman MH. Na+ channel accumulation on axolemma of afferent endings in nerve end neuromas in Apteronotus. Neurosci Lett1989;102:149-54. Levinson SR, Luo S, Henry MA. The role of sodium channels in chronic pain. Muscle Nerve2012;46:155-65. Luo ZD, Chaplan SR, Higuera ES, Sorkin LS, Stauderman KA, Williams ME, et al. Upregulation of dorsal root ganglion (alpha)2(delta) calcium channel subunit and its correlation with allodynia in spinal nerve-injured rats. J Neurosci2001;21:1868-75. Attal N, Cruccu G, Baron R, Haanpää M, Hansson P, Jensen TS, et al. EFNS guidelines on the pharmacological treatment of neuropathic pain: 2010 revision. Eur J Neurol2010;17:1113-e88. Field MJ, McCleary S, Hughes J, Singh L. Gabapentin and pregabalin, but not morphine and amitriptyline, block both static and dynamic components of mechanical allodynia induced by streptozocin in the rat. Pain1999;80:391-8. Ueda H. Molecular mechanisms of neuropathic pain-phenotypic switch and initiation mechanisms. Pharmacol Ther2006;109:57-77. Schüning J, Scherens A, Haussleiter IS, Schwenkreis P, Krumova EK, Richter H, et al. Sensory changes and loss of intraepidermal nerve fibers in painful unilateral nerve injury. Clin J Pain2009;25:683-90. Nickel FT, Seifert F, Lanz S, Maihofner C. Mechanisms of neuropathic pain. Eur J Neuropsychopharmacol2012;22:81-91. Wehnert Y, Muller B, Larsen B, Kohn D: Sympathetically maintained pain (SMP): phentolamine test vs sympathetic nerve blockade. Comparison of two diagnostic methods [in German]. Orthopade2002;31:1076-83. Price DD. Psychological and neural mechanisms of the affective dimension of pain. Science2000;288:1769-72. Willis WD Jr. Role of neurotransmitters in sensitization of pain responses. Ann NY Acad Sci2001:933:142-56. Dougherty PM, Willis WD. Enhanced responses of spinothalamic tract neurons to excitatory amino acids accompany capsaicin-induced sensitization in the monkey. J Neurosci1992;12:883-94. Zhuo M. Glutamate receptors and persistent pain: targeting forebrain NR2B subunits. Drug Discov Today2002;7:259-67. Gebhart GF. Descending modulation of pain. Neurosci Biobehav Rev2004;27:729-37. Porreca F, Lai J, Bian D, Wegert S, Ossipov MH, Eglen RM, et al. A comparison of the potential role of the tetrodotoxin-insensitive sodium channels, PN3/SNS and NaN/SNS2, in rat models of chronic pain. Proc Natl Acad Sci U S A1999;96:7640-4. Watkins LR, Maier SF. Glia: a novel drug discovery target for clinical pain. Nat Rev Drug Discov2003;2:973-85. Guo W, Zou S, Guan Y, Ikeda T, Tal M, Dubner R, et al. Tyrosine phosphorylation of the NR2B subunit of the NMDA receptor in the spinal cord during the development and maintenance of inflammatory hyperalgesia. J Neurosci2002;22:6208-17. Miller KE, Hoffman EM, Sutharshan M, Schechter R. Glutamate pharmacology and metabolism in peripheral primary afferents: physiological and pathophysiological mechanisms. Pharmacol Ther2011;130:283-309. Sung B, Lim G, Mao J. Altered expression and uptake activity of spinal glutamate transporters after nerve injury contribute to the pathogenesis of neuropathic pain in rats. J Neurosci2003;23:2899-910. Malmberg AB, Chen C, Tonegawa S, Basbaum AI. Preserved acute pain and reduced neuropathic pain in mice lacking PKC gamma. Science1997;278:279-83. Mao J, Mayer DJ, Hayes RL, Lu J, Price DD. Differential roles of NMDA and non-NMDA receptor activation in induction and maintenance of thermal hyperalgesia in rats with painful peripheral mononeuropathy. Brain Res1992;598:271-8. Mao J, Sung B, Ji RR, Lim G. Chronic morphine induces downregulation of spinal glutamate transporters: implications in morphine tolerance and abnormal pain sensitivity. J Neurosci2002;22:8312-23. Liu Y, Zheng Y, Gu X, Ma Z. The efficacy of NMDA receptor antagonists for preventing remifentanil-induced increase in postoperative pain and analgesic requirement: a meta-analysis. Minerva Anesthesiol2012;78:653-67. Cohen SP, Liao W, Gupta A, Plunkett A. Ketamine in pain management. Adv Psychosom Med2011;30:139-61. 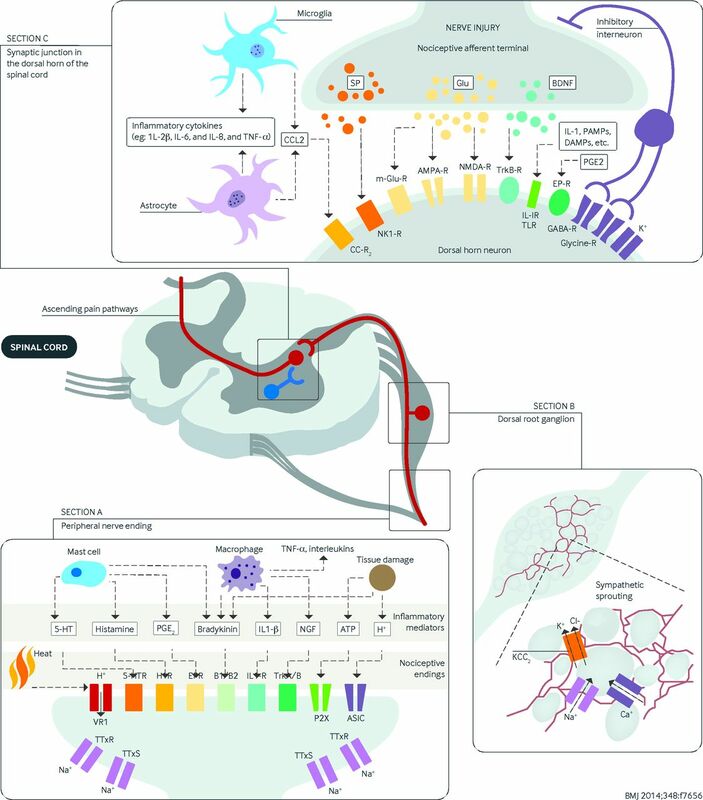 Vallejo R, Tilley DM, Vogel L, Benyamin R. The role of glia and the immune system in the development and maintenance of neuropathic pain. Pain Pract2010;10:167-84. Barkhudaryan N, Dunn AJ. Molecular mechanisms of actions of interleukin-6 on the brain, with special reference to serotonin and the hypothalamo-pituitary-adrenocortical axis. Neurochem Res1999;24:1169-80. Sorkin LS, Doom CM. Epineurial application of TNF elicits an acute mechanical hyperalgesia in the awake rat. J Peripher Nerv Syst2000;5:96-100. Leung L, Cahill CM. TNF-alpha and neuropathic pain—a review. J Neuroinflammation2010;7:27. Lu G, Beuerman RW, Zhao S, Sun G, Nguyen DH, Ma S, et al. Tumor necrosis factor-alpha and interleukin-1 induce activation of MAP kinase in human neuroma fibroblasts. Neurochem Int1997;30:401-10. Olmarker K, Rydevik B. Selective inhibition of tumor necrosis factor-alpha prevents nucleus pulposus-induced thrombus formation, intraneural edema, and reduction of nerve conduction velocity. Possible implications for future pharmacologic treatment strategies of sciatica. Spine2001;26:863-9. Quintao NL, Balz D, Santos AR, Campos MM, Calixto JB. Long-lasting neuropathic pain induced by brachial plexus injury in mice: role triggered by the pro-inflammatory cytokine, tumour necrosis factor alpha. Neuropharmacology2006;50:614-20. Korhonen T, Karppinen J, Paimela L, Malmivaara A, Lindgren KA, Bowman C, et al. The treatment of disc-herniation-induced sciatica with infliximab: one-year follow-up results of FIRST II, a randomized controlled trial. Spine (Phila Pa 1976)2006;31:2759-66. Cohen SP, White RL, Kurihara C, Larkin TM, Chang A, Griffith SR, et al. Epidural steroids, etanercept, or saline in subacute sciatica: a multicenter randomized trial. Ann Intern Med2012;156:551-9. Mika J, Zychowska M, Popiolek-Barczyk K, Rojewska E, Przewlocka B. Importance of glial activation in neuropathic pain. Eur J Pharmacol2013; published online 13 Mar. Mika J, Rojewska E, Makuch W, Przewlocka B. Minocycline reduces the injury-induced expression of prodynorphin and pronociceptin in DRG in a rat model of neuropathic pain. Neuroscience2010;165:1420-8. Johnston IN, Milligan ED, Wieseler-Frank J, Frank MG, Zapata V, Campisi J, et al. A role for proinflammatory cytokines and fractalkine in analgesia, tolerance, and subsequent pain facilitation induced by chronic intrathecal morphine. J Neurosci2004;24:7353-65. Opree A, Kress M. Involvement of the proinflammatory cytokines tumor necrosis factor-alpha, IL-1beta, and IL-6 but not IL-8 in the development of heat hyperalgesia: effects on heat-evoked calcitonin gene-related peptide release from rat skin. J Neurosci2000;20:6289-93. Wang S, Lim G, Zeng Q, Yang L, Sung B, Mao J. Central glucocorticoid receptors modulate the expression and function of spinal NMDA receptors after peripheral nerve injury. J Neurosci2005;25:488-95. Song C, Phillips AG, Leonard B. Interleukin 1 beta enhances conditioned fear memory in rats: possible involvement of glucocorticoids. Eur J Neurosci2003;18:1739-43. Landry RP, Jacobs VL, Romero-Sandoval EA, DeLeo JA. Propentofylline, a CNS glial modulator does not decrease pain in post-herpetic neuralgia patients: in vitro evidence for differential responses in human and rodent microglia and macrophages. Exp Neurol2012;234:340-50. Apkarian AV, Baliki MN, Geha PY. Towards a theory of chronic pain. Prog Neurobiol2009;87:81-97. Lotze M, Grodd W, Birbaumer N, Erb M, Huse E, Flor H. Does use of a myoelectric prosthesis prevent cortical reorganization and phantom limb pain? Nat Neurosci1999;2:501-2. Moseley GL, Flor H. Targeting cortical representations in the treatment of chronic pain: a review. Neurorehabil Neural Repair2012;26:646-52. Tang Y, Chu GY, He HX, Yu CP, An JX, Guo XY. Screening of differentially expressed genes in the hypothalamus of a rat neuropathic pain model following sciatic nerve injury. Chin Med J (Engl)2009;122:2893-7. Kõks S, Fernandes C, Kurrikoff K, Vasar E, Schalkwyk LC. Gene expression profiling reveals upregulation of Tlr4 receptors in Cckb receptor deficient mice. Behav Brain Res2008;188:62-70. Rouwette T, Vanelderen P, Roubos EW, Kozicz T, Vissers K. The amygdala, a relay station for switching on and off pain. Eur J Pain2012;16:782-92. Seminowicz DA, Wideman TH, Naso L, Hatami-Khoroushahi Z, Fallatah S, Ware MA, et al. Effective treatment of chronic low back pain in humans reverses abnormal brain anatomy and function. J Neurosci2011;31:7540-50. Yaksh TL. Behavioral and autonomic correlates of the tactile evoked allodynia produced by spinal glycine inhibition: effects of modulatory receptor systems and excitatory amino acid antagonists. Pain1989;37:111-23. Polgár E, Hughes DI, Riddell JS, Maxwell DJ, Puskár Z, Todd AJ. Selective loss of spinal GABAergic or glycinergic neurons is not necessary for development of thermal hyperalgesia in the chronic constriction injury model of neuropathic pain. Pain2003;104:229-39. Janssen SP, Truin M, Van Kleef M, Joosten EA. Differential GABAergic disinhibition during the development of painful peripheral neuropathy. Neuroscience2011;184:183-94. Moore KA, Kohno T, Karchewski LA, Scholz J, Baba H, Woolf CJ. Partial peripheral nerve injury promotes a selective loss of GABAergic inhibition in the superficial dorsal horn of the spinal cord. J Neurosci2002;22:6724-31. Drew GM, Siddall PJ, Duggan AW. Mechanical allodynia following contusion injury of the rat spinal cord is associated with loss of GABAergic inhibition in the dorsal horn. Pain2004;109:379-88. Miraucourt LS, Dallel R, Voisin DL. Glycine inhibitory dysfunction turns touch into pain through PKC gamma interneurons. PLoS One2007;2:e1116. Kohno T, Ji RR, Ito N, Allchorne AJ, Befort K, Karchewski LA, et al. Peripheral axonal injury results in reduced mu opioid receptor pre- and post-synaptic action in the spinal cord. Pain2005;117:77-87. Przewłocki R, Przewłocka B. Opioids in chronic pain. Eur J Pharmacol2001;429:79-91. Benedetti F, Vighetti S, Amanzio M, Casadio C, Oliaro A, Bergamasco B, et al. Dose-response relationship of opioids in nociceptive and neuropathic postoperative pain. Pain1998;74:205-11. Zeilhofer HU, Benke D, Yevenes GE. 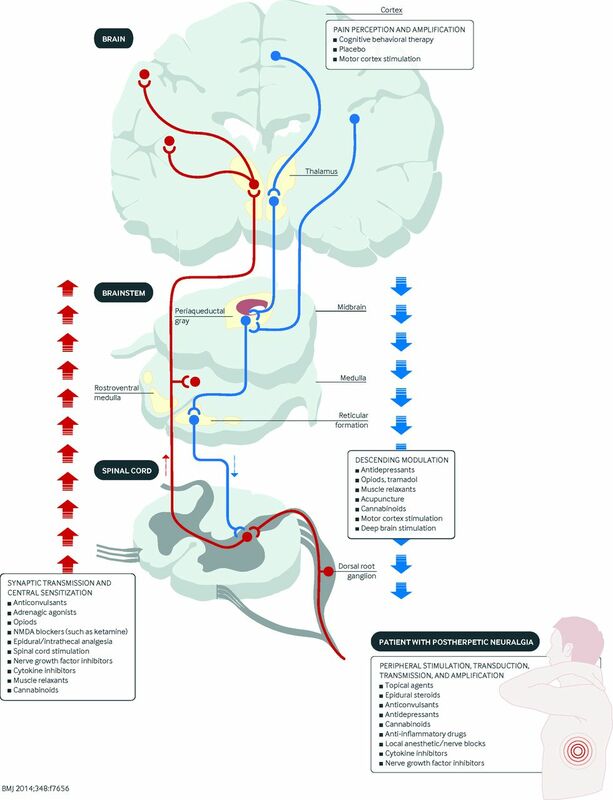 Chronic pain states: pharmacological strategies to restore diminished inhibitory spinal pain control. Annu Rev Pharmacol Toxicol2012;52:111-33. Zakrzewska JM, McMillan R. Trigeminal neuralgia: the diagnosis and management of this excruciating and poorly understood facial pain. Postgrad Med J2011;87:410-6. Zhuo M, Gebhart GF. Biphasic modulation of spinal nociceptive transmission from the medullary raphe nuclei in the rat. J Neurophysiol1997;78:746-58. Dubner R. The neurobiology of persistent pain and its clinical implications. Suppl Clin Neurophysiol2004;57:3-7. Goffaux P, Redmond WJ, Rainville P, Marchand S. Descending analgesia—when the spine echoes what the brain expects. Pain2007;130:137-43. Wager TD, Rilling JK, Smith EE, Sokolik A, Casey KL, Davidson RJ, et al. Placebo-induced changes in fMRI in the anticipation and experience of pain. Science2004;303:1162-7. Valet M, Sprenger T, Boecker H, Willoch F, Rummeny E, Conrad B, et al. Distraction modulates connectivity of the cingulo-frontal cortex and the midbrain during pain—an fMRI analysis. Pain2004;109:399-408. Enck P, Benedetti F, Schedlowski M. New insights into the placebo and nocebo responses. Neuron2008;59:195-206. Wei F, Dubner R, Zou S, Ren K, Bai G, Wei D, et al. Molecular depletion of descending serotonin unmasks its novel facilitatory role in the development of persistent pain. J Neurosci2010;30:8624-36. Bannister K, Bee LA, Dickenson AH. Preclinical and early clinical investigations related to monoaminergic pain modulation. Neurotherapeutics2009;6:703-12. McCleane G. Antidepressants as analgesics. CNS Drugs2008;22:139-56. Ciaramitaro P, Mondelli M, Logullo F, Grimaldi S, Battiston B, Sard A, et al; Italian Network for Traumatic Neuropathies. Traumatic peripheral nerve injuries: epidemiological findings, neuropathic pain and quality of life in 158 patients. J Peripher Nerv Syst2010;15:120-7. Barrot M. Tests and models of nociception and pain in rodents. Neuroscience2012;211:39-50. Quintero GC, Herrera J, Bethancourt J. Cortical NR2B NMDA subunit antagonism reduces inflammatory pain in male and female rats. J Pain Res2011;4:301-8. Siu A, Drachtman R. Dextromethorphan: a review of N-methyl-d-aspartate receptor antagonist in the management of pain. CNS Drug Rev2007;13:96-106. Yoon MH, Yaksh TL. The effect of intrathecal gabapentin on pain behavior and hemodynamics on the formalin test in the rat. Anesth Analg1999;89:434-9. Clarke H, Bonin RP, Orser BA, Englesakis M, Wijeysundera DN, Katz J. The prevention of chronic postsurgical pain using gabapentin and pregabalin: a combined systematic review and meta-analysis. Anesth Analg2012;115:428-42. Vo T, Rice AS, Dworkin RH. Non-steroidal anti-inflammatory drugs for neuropathic pain: how do we explain continued widespread use? Pain2009;143:169-71. Cohen KL, Harris S. Efficacy and safety of nonsteroidal anti-inflammatory drugs in the therapy of diabetic neuropathy. Arch Int Med1987;147:1442-4. Dieleman JP, Kerklaan J, Huygen FJ, Bouma PA, Sturkenboom CJ. Incidence rates and treatment of neuropathic pain conditions in the general population. Pain2008;137:681-8. Schulman EA. Overview of tension-type headache. Curr Pain Headache Rep2001;5:454-62. Seminowicz DA, Laferriere AL, Millecamps M, Yu JS, Coderre TJ, Bushnell MC. MRI structural brain changes associated with sensory and emotional function in a rat model of long-term neuropathic pain. Neuroimage2009;47:1007-14. King T, Vera-Portocarrero L, Gutierrez T, Vanderah TW, Dussor G, Lai J, et al. Unmasking the tonic-aversive state in neuropathic pain. Nat Neurosci2009;12:1364-6. Langford DJ, Bailey AL, Chanda ML, Clarke SE, Drummond TE, Echols S, et al. Coding of facial expressions of pain in the laboratory mouse. Nat Methods2010;7:447-9. Baliki MN, Petre B, Torbey S, Herrmann KM, Huang L, Schnitzer TJ, et al. Corticostriatal functional connectivity predicts transition to chronic back pain. Nat Neurosci2012;15:1117-9. Goodsaid F. Challenges of biomarkers in drug discovery and development. Expert Opin Drug Discov2012;7:457-61. Lariviere WR, Mogil JS. The genetics of pain and analgesia in laboratory animals. Methods Mol Biol2010;617:261-78.